Here, gathered around Most Rev. Joseph Perry, the vicar of our bishop, Blase Cupich, the people of San Rocco welcome you to our website. As the successor to San Rocco Parish, this Oratory sustains the community that is here, Sunday after Sunday. We welcome you online and in person, by email and by letter, by word and by prayer. Also, note that our hall, named after St. Anthony, is available for rental, for special occasions, such as baptisms, first Communions, quinceanera, weddings, and funeral luncheons. 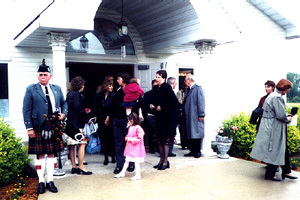 Even people who are not regular members of San Rocco Oratory are welcome to rent the hall. Your contact person is Yvette Betancourt at (708) 654-7497 or dyvetteb18@yahoo.com. This hall is at 330 East 21st Street in Chicago Heights. The entrance is on the east side of our main parking lot, east of the church building. Do you have questions about Give Central? How do you benefit? Get your answers here. Click on: Donor Benefits. Well, OK. Do you have even more questions? Click on: FAQ for Donors. To drive here from the north, say, from the Tri-State Expressway (I-294), exit southbound at Halsted. Go south to Lincoln Highway, which in Chicago Heights is 14th Street. At the intersection, turn east (left) and proceed under the viaduct. Immediately after the viaduct, at the light, turn south (right) onto East End Avenue. Continue south on East End for one mile until you come to 22nd Street. There, turn east (left) and continue on 22nd for about half a mile. San Rocco Oratory of Chicago Heights is a white building, a small church, with a steeple, set back from the north side of 22nd Street, on the left. The address is 315 East 22nd Street, Chicago Heights, IL 60411; that's west of State Street. You can reach Father Gilligan, the Rector, at (708) 331-5485. Our fax number is (708) 331-5484. Our e-mail address is acp@acpress.org. To drive here from the east, say from the Calumet Expressway, exit westbound at Lincoln Highway. Go west on Lincoln Highway to State Street. There, turn south (left), and continue to 22nd Street, right after the second set of railroad tracks. If you're going too fast, it's easy to miss the turn. Go west (right) to 315 East 22nd. The oratory is a white building, a small church, with a steeple, set back from the north side of the street, on the right. Click here to see a street map, online, to find San Rocco Oratory. Here's another link for a map from Map Muse! Search for Books You Want, by Author, Title, Subject, or ISBN. A percentage of your payment will go to San Rocco Oratory. Here is the front entrance to San Rocco Oratory of Chicago Heights. Here, to the east of the main parking lot, is the new Assembly Hall, for the San Rocco family and the wider community as well. It is equipped with full dining and kitchen facilities. 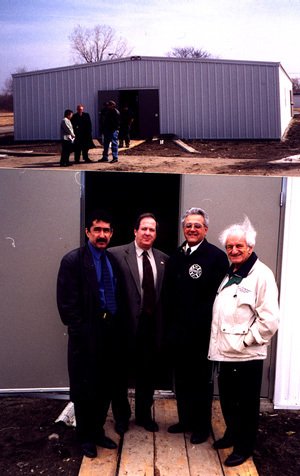 Below, from the left, are those who worked on its construction: Andy Fernandez, of the Chicago Archdiocese, August Anzelmo, Fred LoBue, and John Onofrio. John designed both the church and the hall and was the general contractor for this project.